This weeks pizza was a little last minute, and it was almost 9pm when we sat down to eat dinner so I only took a couple of really quick photos. Luke & I have made this pizza a few times and find its the best 'throw together' topping as you can basically use any vegetable you have. 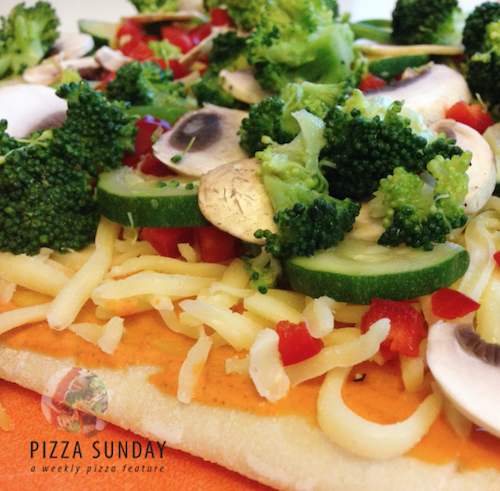 This week we used steamed zucchini & broccoli, capsicum, mushroom, shallots & cheese on a tandoori sauce base. Alternatively you can use a naan bread as the pizza base, which we have done in the past due to a pizza base shortage at the shops. It also tastes good with a Pimm's! That is really the best thing about pizza is that you can truly throw anything on it and it is still good. 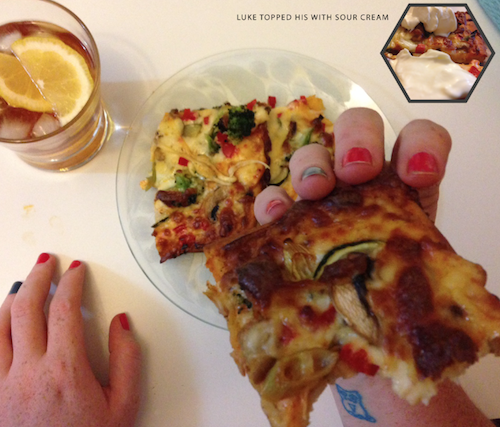 It is hard to screw up a pizza. But I have never tried tandoori sauce, sounds tasty!